Why does the design of a high-quality agricultural index product require a good understanding of the agricultural cycle? Historically, the first index insurance design dates back to 1920 when Indian economist Chakravarti envisaged a rainfall insurance product in which claim payments would be due if the total rainfall during a season was less than a given threshold. However, indices today are highly tailored to reflect the phenological stages of crop growth and therefore require a deep understanding of the agricultural cycle. For instance, an index needs to capture that even if total seasonal rainfall is high, a short dry spell at a particular moment of the crop growth can trigger large crop losses. Building a high quality index allows an insurer to reduce basis risk (see What is basis risk?). 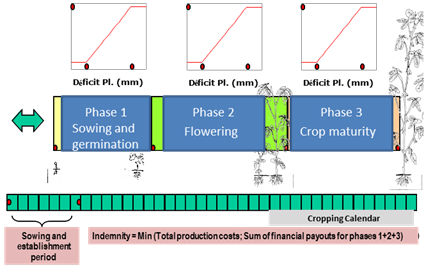 Below is an example of a three phase drought contract used in the design of index insurance in Senegal.